Pig farm, as a part of the Research and Education Center Patent IEC in Crvenka, started operating on June 6th 2016. 200 large white gilts, and 6 boars have arrived on the farm from Denmark. The genetics is Dan Breed and all animals have very high genetic potential. 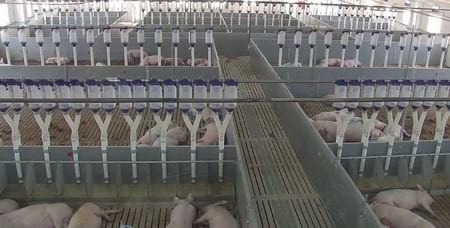 According to the plan, the farm will be productive - experimental type, dedicated to the production and sale of F1 gilts, as well as carrying out trials in all stages of production. Trials will be performed in function of research and development – improvement of existing Patent co. products and development of new products. Farm project, management, as well as the accommodation, food, care and welfare of animals are in line with Danish and EU principles. Special attention was paid to biosafety measures and very strict measures of external and internal biosecurity. Considering that the animals originate from SPF farms, the highest health status must be applied, in order to maximize the protection of animal health. Animals are currently in quarantine where all the medical tests were implemented/executed in accordance with the Law on Veterinary Medicine. After the expiration of the statutory 30-day quarantine, the animals will enter production cycle.